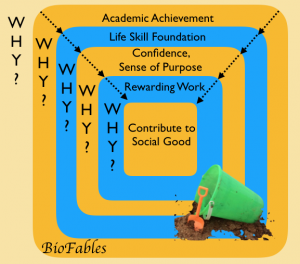 Consultants and others use the technique of asking “Why” five or more times in order to dig deeper and extract further information. Each answer to Why? builds on the previous answer. So, why might children — or anyone — read BioFables and their Companion reference books? Let’s take a look at the Whys and see where they take us. We believe that good grades matter, even if they’re not THE last (or only) word for increasing the likelihood of success later in life. 38/71 24/71 24/71 What do these numbers refer to? These are the rankings of U.S. students on math, science and reading scores, respectively, compared with their peers in 71 countries. The 38/71 ratio means that students in more than half of the 71 countries participating scored higher than U.S. students in science. The figures for science and reading are better, but certainly not impressive. The same study shows that 29% of students have dropped below basic math proficiency in recent years. It’s not simply about getting good grades. It’s about acquiring the tools–and the midset–for building life skills. Change seems to happen faster than ever. What’s new today will be old tomorrow. Understanding the basics of math and science, along with reading lots of different kinds of books, provides the toolkit needed to cope and thrive in this environment. BioFables books offer numerous aha! moments of insight that can be applied to new experiences. Once you learn, for example, how to estimate the distance across a river (Palisades Escapades), you can confidently apply that skill to similar (but unfamiliar) situations. Life becomes less of a mystery when you can apply basic skills and know where to look for further learning. Confidence builds as experimentation and observation confirm the basic lessons that you’ve learned. That feeling of confidence usually leads to a desire to accomplish even more. Finding a sense of purpose in life is driven by the skills you’ve developed and accomplishments you’ve enjoyed. Three factors come into play in finding meaningful work and a satisfying future: 1) a sense of purpose; 2) the opportunity to put the set of life skills that are uniquely yours to valued use; and 3) the drive to lifelong learning. Each of the BioFables books incorporates work and career anecdotes of adult family members. This website’s biographies of Mom (Agnes Maloney), Dad (Mort Maloney) and Grandpa (Mike Maloney) appear under the BioBlog category. Good, the noun, comes in several flavors. Two of them are relevant here. One is personal good that benefits the individual, such as healthy eating and exercise habits. The other is social (or public) good. You’ve heard the saying, “a rising tide raises all boats.” Meaningful work is the rising tide that raises one’s personal boat (through wages and psychological rewards, among others) as well as the social boat (by playing a role in producing beneficial products or services, discovering new medical therapies, advancing important technologies…well, you get the idea). We hope BioFables books contributes to such rising tides!